The sun is shining, birds are chirping, and I somehow just got an email from Al Franken with the subject line “Time to panic.” Looks like it’s Debate Day. 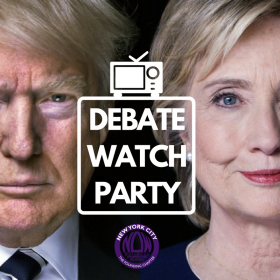 As Hillary and Donald face off in Long Island tonight, some will watch alone in the dark, while clutching a pint of ice cream in sheer fear. Others will jump into the thick of it and head to Hofstra University, where street performer and purveyor of love and farts Matthew Silver will be debating fringe candidate Vermin Supreme. Good luck finding them. Thousands of protestors — not to mention a 51-foot joint — are also expected to descend on the Hempstead school. Don’t worry, you can also watch from a safe distance. Here’s who’s throwing watch parties, offering drink specials, or otherwise spicing up this evening of discourse. Some people are on the FBI Watchlist. Well, this is the RNC Watchlist, where you can settle down at a bar, event space, or Republican haunt (if you’re nasty) and bear witness to the great and terrible orange man, as he drips words and possibly froth from his mouth, instilling fear into impressionable folk about how no one can save our country but him. Though the news has painted a fairly grim picture of the US recently, I’m pretty sure Donald and I have different definitions of what “saving” something means. If the reality of this week’s Republican National Convention is too wretched to behold as truth, you can pretend you’re watching a movie. But let’s hope it’s a movie that compels you to educate yourself and vote in all of your state and local elections, in addition to the big one in November. You can be the change you want to see in the world… If your vote manages to be counted, that is. Yikes.